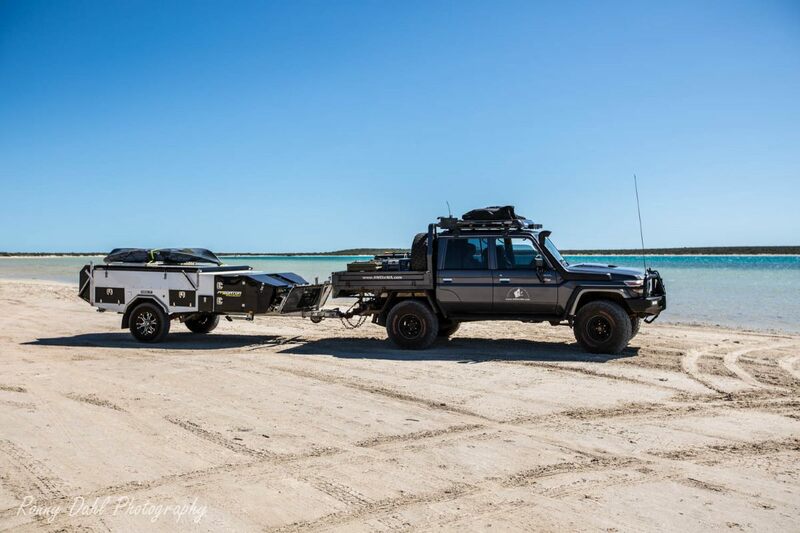 As of late August 2016 we (my wife, 2 kids and I) took a camper trailer out for a test run on a family overland trip to Shark Bay, Western Australia. Predator Campers kindly let us take their 'larger' version called the PUMA FF. 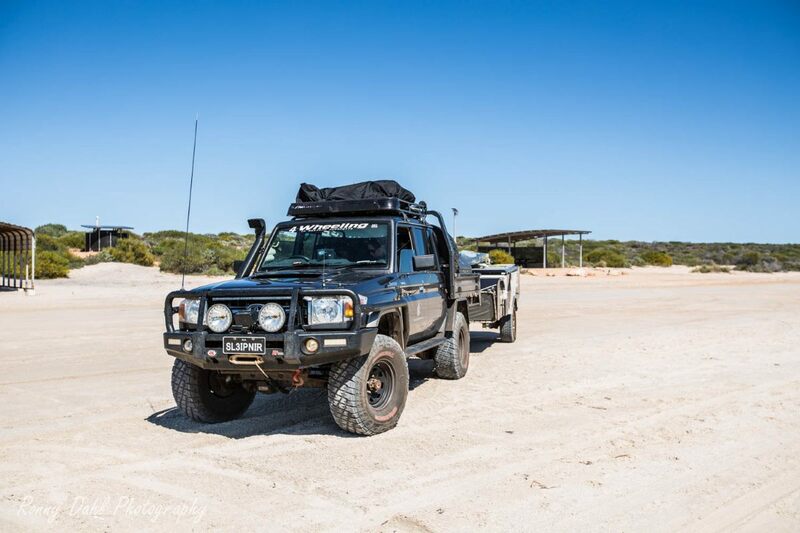 This larger style of camper trailer weighs 1.4t (dry) has off-road independent (wishbone) suspension with plenty of clearance fitted with 32' tyres plus one spare on the rear, more details on the specs below. Now as you may or may not know I'm used to camping in swags and tents, swags are my preferred and tenting with our RV5 Oztent on family trips. So on either solo of family trip we are used to the quick pack and go style of camping. However with that in mind if we were using a location as a 'base camp' we'd often just hire a cabin at a caravan park which is not really camping, but it was the best way for us as a family to have a more organized and easier way to deal with very young kids. After all we used to carry porta cots, high chairs, toys for different aged kids, nappies and the list goes on. All that is too hard (less enjoyable) to bring on longer trips especially if not all family members enjoy roughing it! With this in mind if you are looking or thinking of the camper trailer style of camping this article will shed some light on what it is like compared to just vehicle camping. Now to our experience, learning, driving/towing, fuel consumption and our highs and lows. These types of trailers require vehicles to be fitted with a brake controller kit and it's a good idea to fit an Anderson plug to the rear so you can top up the camper trailer batteries using the towing vehicles alternator while driving. Lucky for me Perth Diesel Performance who have maintained my 79 series Landcruiser since new looked after me and installed a redark kit to the Landcruiser which is adjustable on the fly and sorted the 12v Anderson feed to the rear. One more thing PDP did before I got the cruiser back was to adjust one of my custom tunes specific for towing (more on custom tunes here). Picking up the camper trailer from Predator Campers and getting a quick run-down plus some instructions on the annex added to the excitement of the family trip. The first few things that came to our minds were the extra amount of gear and food we could bring including all the camera gear I could bring which is normally impossible on family trips as the camera gear takes up the entire back seats. We brought it home and loaded it up! We set off with the plan to drive as far as we could and just quickly setup with the idea of packing early in the morning again just like our usual pack and go style of camping. Well that didn't exactly go to plan being the first night we setup the camper trailer things took longer than thought and time got away... We just setup the main part of the camper. Morning pack up took a while as it was again a first time for us but we got on the way and arrived at the next camp with plenty of day light. This time we setup with the annex and guess what? I lost the instructions... Yep, I was warned before the trip that I'd need to look at the instructions for the annex in order to set it up as it’s a bit complex... Hahaha well we weren't laughing! Not until after we finally worked it out of course and we didn't end up in the classic camping divorce drama show that you have no doubt seen many others preform at a caravan park near you. This is when we learnt that a camper trailer setup with the annex is highly only recommend for camping at least 2 or more days at a time. The camper trailer is for a 'base camp' style of camping. Yes you can just setup with the main part but you still have to move all the gear you have stacked inside the camper. Lessons learnt from the previous afternoon we changed our plans and extended our stay for another night rather than pack and go again. This was much better and we finally experienced the camper trailer in the way it is meant to be used. Packing up the annex and trailer took a while especially with the little ones running around. Yet we were in the road and headed for Monkey Mia (a very popular and beautiful place in Shark Bay). Once we arrived we wasted no time and got straight into setting up camp and this time for 3 nights 4 days. We managed to get the annex diagram sent to us via photo message and this time it made a lot more sense. We then headed of for what turned out to be an awesome day. Waking up knowing we didn't need to pack up and go was awesome, we simply had breakfast and shot off for a very big day 4 wheeling, fishing and kayaking. After the massive day of adventure it was great returning to 'base camp'. This is when we started to really notice the benefits of camper trailers this size. Another early start to an adventurous day coming back to 'base camp' again. Each day just seemed to get better and feel better. Packing up and heading for a stop on the way home to break up the drive. Hamelin Pool Caravan Park was our last night in the camper. This time we only setup the camper without the annex and we were getting quite quick at setting up. This size camper trailer is meant for the base camp style of adventures/recreation. Heading to places for an overnight stay continuously is not what they are built for. That said once you are used to the setting up it’s a faster process as we found on the last days of our trip. Would we take one out for a family trip again? Yes we would but next time we will be planning to stay just at one or two places for more than 3 nights. Base camp, extra storage, can carry boats and kayaks, a home on wheels including the kitchen and plenty of water storage. A home away from home on wheels. Setup and pack up time at short stays, extra fuel consumption but not near as bad as towing a full size caravan. 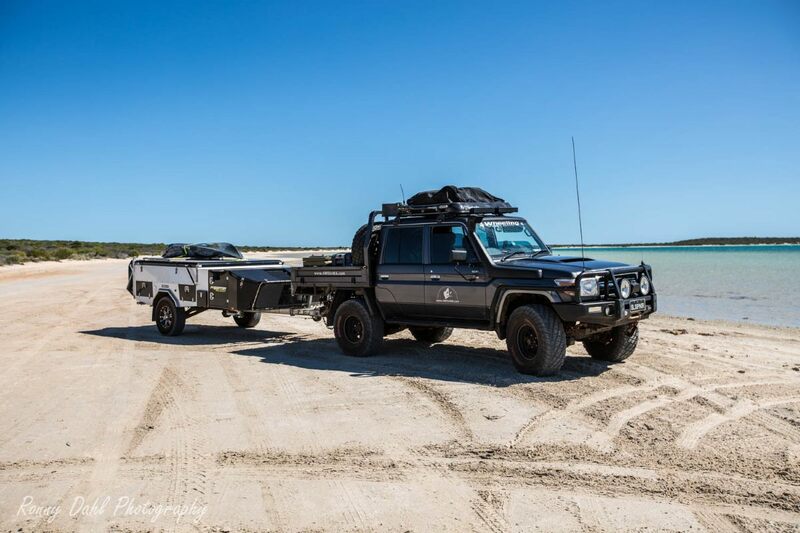 Leave Camper Trailer And Go 4 Wheeling In Western Australia.